‘Pool’ was one of two commissions for Leeds International Pool by Leeds City Council in 2008 that took place prior to the building being demolished. It was a site specific installation for the learner pool that referenced and celebrated the history and multifarious functions of the building over its 40 year history. 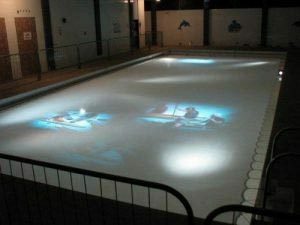 A semi transparent screen was fitted in the pool at water level and lit from below to create a luminous glow. From the ceiling a series of projectors intermittently projected images onto different parts of the screen, showing people undertaking various activities associated with Leeds International Pool that had fallen into disuse over the years. For example, the slipper baths where men and women could take a bath; the remedial pools where the injured were treated; the Turkish baths where people relaxed and took different treatments; the Jewish Mikvah for religious immersions; the main pool which hosted galas, races and matches. The installation was viewed from tiered seating at one end or by walking along the pool side. The aim was to create a sensitive intervention where images emerged and submerged as sounds reverberated around the empty space. The title of the work related to the many different pools or baths in the building, but also to the different groups, teams or pools of people that used Leeds International Pool over the years.